The components of a disappearing waterfall include the waterfall catch basin as the source of the water, a submerged pump in the catch basin that circulates water through tubing up to the head of the waterfall where it empties into a weir (this is just a box which diffuses the water to create a natural appearing waterfall) before spilling over the lip of the weir and cascading down to the rocks below. Gravity then encourages the water down the stream-bed if you have one, where it collects in the catch basin, ready for the return trip up the tubing. you need to decide how much water you want to flow over a waterfall. 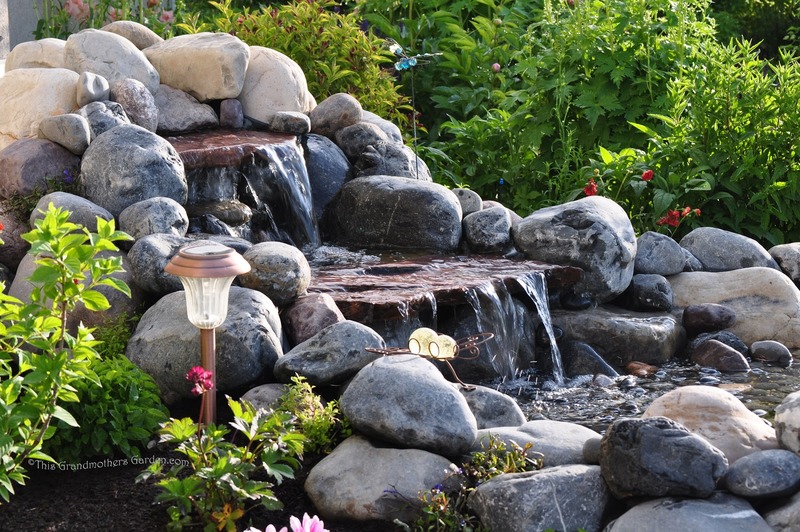 Half-inch deep waterfalls are common for residential water features, which really is plenty to give you a sound that you will enjoy. The Waterfall Flow Calculator will reveal that wider waterfalls and deeper flows come with a cost—the need for a bigger pump. Note that the resulting recommendation of the calculator (in gallons per hour, or gph) is how much flow you need at the top of the waterfall. If the recommended flow at the top of the waterfall is 1,200gph, you will need a pump rated at more than 1,200gph, since you will need to factor in the amount of force needed to push the water to the top of the waterfall. This force (also known as head pressure) is influenced by the height of the waterfall, the length of the tubing you are using, and the fittings used to connect the tubing. Pumps are rated at being able to deliver a quantity of gallons per hour depending on the head height, which really means the calculated head pressure—not simply the height of the waterfall. This Head Pressure Calculator will tell you the height of your waterfall as perceived by the pump. For example, if your waterfall is 3 feet high, and you have one 90 degree fitting, 15 feet of pipe, and two other fittings, this would be equivalent of lifting the water 8.5 feet high. When shopping for pumps, you will need to find one that delivers 1,200gph at 9 feet head height, not 3 feet. we could then select the right pump. from our local sprinkler supply store that proved very capable. The waterfall and stream begin at the waterfall weir. Here’s a good picture of a weir. As you can see, they can be expensive. Next post I’ll show you how to build one for much less. Wonderful, Carolyn! You have given me inspiration! Wow I knew there was a good reason to hire someone to build my pond and waterfall...I am learning so much! Actually Donna, we're trying to convince you that if a Grandma and Grandpa like us can build this amazing waterfall, certainly most anyone can do it themselves as well. Having a plan, and working the plan is key. What we didn't know, we googled, and we're sharing our best resources through this series. Actually Donna, we're trying to convince you that if a Grandma and Grandpa like us can build this amazing waterfall, certainly most anyone can do it themselves as well. Having a plan, and working the plan is key. What we didn't know, we googled, and we're sharing our best resources through this series. Besides, if you hire a contractor... you miss out on all the fun! Give it a go, and let us know how much fun you had! Oh, you are a a temptress if ever there was one!!! this is so helpful, and I appreciate your attention to detail in explaining each step. When my husband and I build one, we will know how. I really admire all your hard work making a waterfall, and showing us how to, also. I've dreamed of putting in a waterfall down by the big pond, but that will be years and years away. I still look at your instructions on putting in a flagstone patio, and dream. You amaze me! Merci pour les explications. Good day.